In 1505, Michelangelo was commisioned by Pope Julius II to build his papal tomb. It was to be a massive project , he had designed a three-story monument which would have contained over 40 marble sculptures. But due to mounting money shortages, he was constantly interrupted to work on other tasks, and as a result the tomb took over 40 years to complete and even than not to his satisfaction. 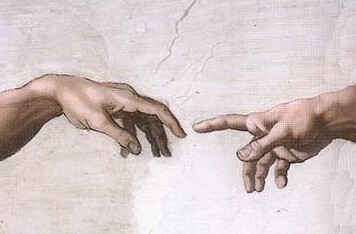 During this time, from 1508 to 1512, he worked on the Sistine Chapel ceiling, though he had a dislike for painting. He was commissioned to paint the 12 apostles, but he expanded the vision to include almost 300 figures, covering over 5000 square feet in frescos, in the end omitting the apostles altogether, saying it would have been a waste of space! It is a monumental work, much more than any artist could single handedly, accomplish in one lifetime. The frescos depict scenes from the Book of Genesis in the centre panel, and on either side of these are figures of prophets and sibyls who foretold the coming of the Messiah, also are scattered smaller figures of cherubs and ignudi. 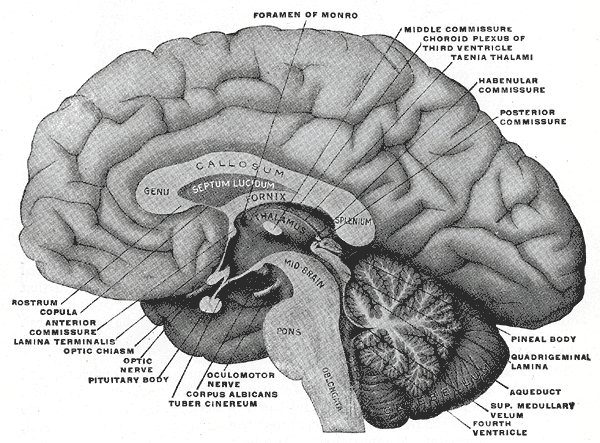 Dr. Frank Lynn Meshberger, from Indiana, was the first person to notice that the part of the painting containing God and the angels appeared to be an anatomically accurate picture of the human brain, including the frontal lobe, optic chiasm, brain stem, pituitary gland and the major sulci of the cerebrum. In 1990, he published his theory in the Journal of the American Medical Association where he argues that there appears to be communication present despite the gap between the depicted Adam and God, just as neurons transmit biochemical information across synaptic clefts. Looking at these images, I struck me all of a sudden, of the Mother`s (Mirra Alfassa) explanation of the Creation of Man according to the Bible. She had said that it is a story (put in a child-like manner) not of the physical creation of man, but of the coming down of the mind onto earth. 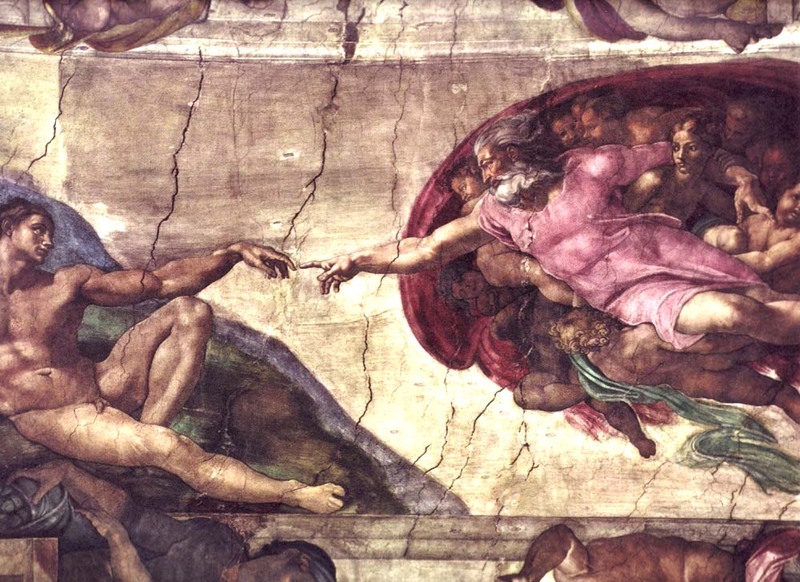 If we look at the painting, we can see that Adam is already alive, with eyes open, reaching out to God; so it cannot be that Michelangelo was showing that God was giving life (breath) to man, he is showing the scene where God is bestowing the intellect or intelligence to Man. (so the story is not such a departure from Darvin`s theory of evolution, after all!) It seems amazing that not only had Michelangelo dvelved into such matters so deeply, but had also used those insights in his works. 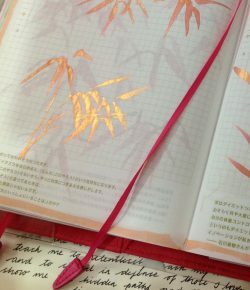 Continued in my next post….